the standard color profile (from Epson for the 750 and the 1200) gives a result much too saturated and too dark. There is a complementary profile that you may download here. First, install the original profile and then add the complementary one. It will leave two files EE051__1.ICM and EE051__1.ICC. A nightmare! There is no color profile to be found anywhere. Configuration menu from the monitor: sRGB color (apparently, this is roughly equivalent to 6500K and a gamma level of 2.2). Color profile: IEC 61966-2.1 default RGB color space - sRGB. 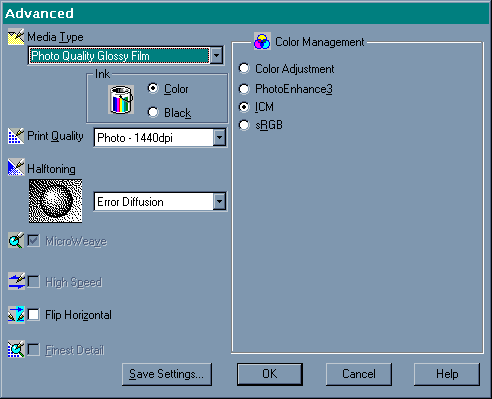 I use the configuration of the Espon driver to adapt it to the presence of the modified color profile I just loaded. I don't know if with all this you will be able to avoid using expensive calibrating software and hardware (maybe some from Pantone), but you should be able to reach much improved printing results without investing all your money in a calibration software and its calibrating spider.